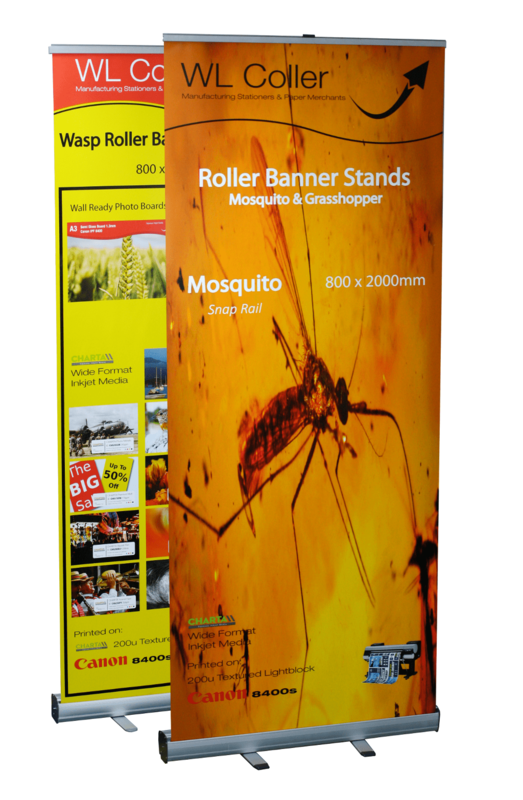 A choice of 2m tall Mosquito or Firefly anodised aluminium roll up display stands, suitable for indoor use. Pre-Printed on a choice of Matt, Textured Satin or Gloss finished lightblock banner material, using Canon iPF wide format inkjet printers. The aqueous pigment ink dyes are UV and water-resistant* resulting in bright, durable and superb quality prints. Banner stands will be supplied with the printed Lightblock media mounted onto the stand and ready for display. Complete with a handy carry bag. You supply us with the ready to print artwork** (in PDF, Ai, JPEG format etc.) and we’ll do the rest. Matt Lightblock: A good quality opaque matt coated vinyl. Satin Textured: Has a slightly textured surface with a high satin finish and is scuff-resistant. Produces a striking display, the print finish also being water-resistant. Gloss Lightblock: A good quality opaque Gloss coated vinyl. * Matt Black ink used on the Matt Lightblock Media is not fully waterproof. ** Artwork should be 800mm x 2200mm ( 2000mm length visible, the bottom 200 for attachment to the stand) Avoid text and borders close to the edges as they may be trimmed or have uneven spacing. Twist out feet for easy packing.